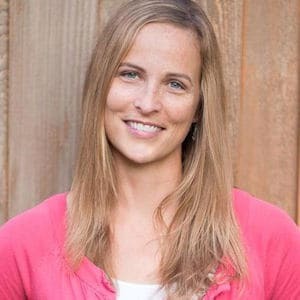 Deer are a big problem for many gardeners, and I get a lot of questions about what plants are deer resistant and how to create deer proof gardens. Fortunately I’ve never had to deal with deer in my garden, so I called in an edibles expert to help out. 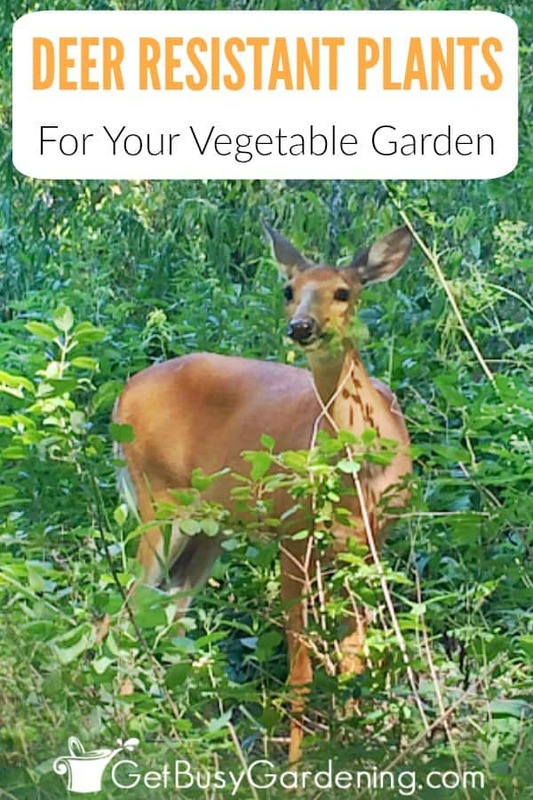 In this post, she shares her best tips for keeping deer out of the garden, including a nice long list of deer resistant vegetables to grow. Most food gardeners know there is no such thing as a deer proof vegetables or plants that deer don’t eat – if hungry enough, deer will eat anything – but over the years I’ve learned that certain vegetables and herbs are less palatable. My own 2000 square foot garden is now surrounded by an electric deer fence, but for almost 20 years, I relied on deer resistant herbs and vegetables and simple plastic netting for protecting plants from deer, with varied success. I learned early on which vegetables deer don’t like, which were occasionally deer resistant vegetable plants, and which plants deer like to eat the most (peas and beans). Through trial and much error, I discovered several types of garden vegetables deer won’t eat. Generally, they will stay away from edibles that are smelly, strong-flavored, prickly, toxic or hiding beneath the earth (roots & tubers). You can even pair the vegetables deer don’t like to eat with the plants that deer love to eat in order to (hopefully) deter deer from grazing on your prized pole beans. Deer do not like pungent smells, so make friends with aromatic deer repellent plants like garlic, onions, scallions, leeks, fennel, chives, and garlic chives. Fragrant herbs, like mint (only grow in a pot! ), dill, rosemary, chamomile, basil, and oregano are also less appetizing and can sometimes repel deer. Vegetables and herbs with strong tastes are not as tempting to deer as tender lettuce, chard and baby kale. Fawns that don’t know better may take an experimental bite, but typically parsley, thyme, sage, lemon balm, lavender, and cilantro are herbs deer won’t eat. 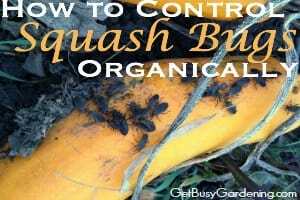 I certainly wouldn’t want to eat prickly or sharp leaves, and deer usually feel the same way, shunning plants like squash, zucchini, pumpkins, cucumbers, globe artichokes and cardoon. That’s not to say that I haven’t seen the occasional bite out of my cucumber or squash fruits, but once the leaves are growing thick, the deer seem to pass them by. 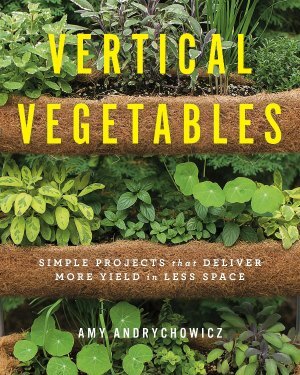 Another trick is to grow vining crops vertically, like squash and cucumbers on A-frame trellises (something like this or this one work great!). The shape of the trellis means most fruits will grow inside the ‘A’ of the structure, sheltering them from marauding deer. Deer are ruminants, which means they ferment food in their stomachs and can digest a very wide range of plants. Yet, there are still plants that are toxic to them. This list of deer resistant plants that are toxic includes rhubarb and members of the tomato family (tomatoes, peppers, eggplants). That said, there have been numerous years that deer have devastated my newly planted tomato beds, nipping the tops off the young plants. However, generally these are vegetables that deer won’t eat, especially once the plants have reached a mature size. My rhubarb has never been touched by deer. Because of their subterranean location, root and tuberous crops are often deer resistant garden vegetables. That said, deer do love to munch on the tops of root veggies like carrots, beets, radishes and potatoes, which can stunt their growth. I find that floating deer netting on top of mini hoops will exclude the deer and give your root veggies the time they need to mature. 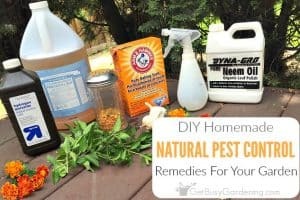 And, since we’re on the topic of creating deer resistant gardens, I thought I would quickly address another question I often get asked – does using deer repellents work to keep deer out of the garden? The short answer to this is yes, but… you have to be diligent about it. 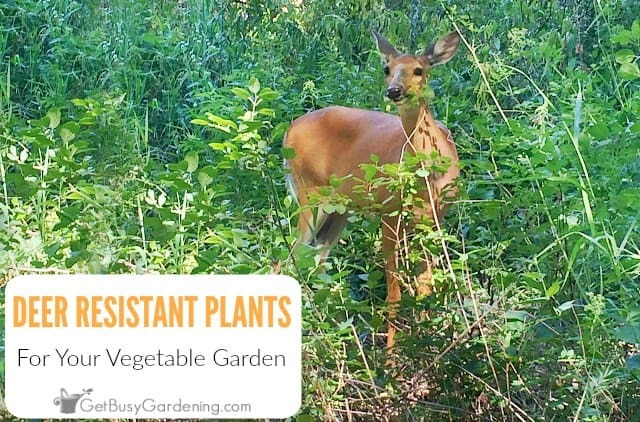 Mixing deer resistant vegetables and herbs, along with the continued use of deer repellent for plants will definitely give you the upper hand. 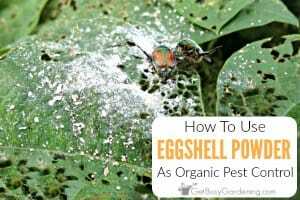 Just be sure to use organic deer repellent spray in your vegetable garden. This is a good brand of natural deer repellent, as well as this brand – and this deer spray repellent came highly recommended from a friend. For quick reference, here is the full list of deer resistant vegetables and herbs listed above for you to try. Some of these are plants that keep deer away, and others are plants deer will not eat (usually). Unfortunately, there is no such thing as deer proof vegetables, but there are many types of deer resistant plants that they don’t like. 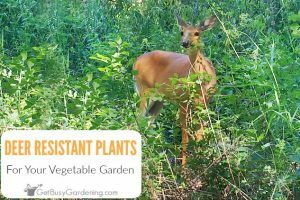 So, if you have a problem with deer eating plants in your vegetable garden, take some time to create a deer resistant vegetable garden design plan. Surround your vegetable garden with deer resistant vegetables and plants that deter deer, then plant the ones that they love in the middle. Getting into the habit of doing this every year will help you create more deer resistant gardens. Share your experience with using deer resistant vegetables and herbs to create a deer resistant garden in the comments section below. Deer ate all my rhubarb – leaves and stems. Oh no!! Sorry to hear that. If only there were plants that were deer PROOF! LOL. As a last resort last year we hung irish spring soap in knee high stockings all through the vining pole beans. It stopped the deer over night and we didn’t have anymore trouble. We will try it again this year but will start early before they start eating all the leaves.